This course teaches you how to develop engaging e-Learning by outlining the steps needed to create an instructionally sound course. It is directed to anyone who wants to build an e-Learning course but who is not an eLearning expert: teachers, trainers, and subject matter experts. This course contains content, questions and and all the components typically included in an e-Learning course. The principles presented here apply to eLearning courses created in any authoring tool. However, we will use easygenerator so you'll be able to build courses in easygenerator after you finish the course. It will take about 30 minutes to complete this course. We will use the development process of this course as an example. In this course some sections are marked with this logo. They describe the process easygenerator used when we created this course. Our problem: Many non e-Learning experts use easygenerator. However, the quality of their courses are not at the highest level. We wanted to fix this problem. Why is this a problem? It is a problem because the courses will be less effective and therefore these authors may stop developing eLearning courses, and no longer use (or buy) easygenerator! So it is our business problem to increase the quality of the courses to support non eLearning developers so they will continue to use and buy our product. Our goal: The goal is the flip side of the problem. This means our goal is: Easygenerator authors should create instructionally sound eLearning in 50% of all created cases in January 2015 (instead of 30% now). Please note we made this goal measurable by setting the 50% target and a we added an end date. All six elements are part of the solution. Not one of them is the whole solution. We don't have enough customers. We will increase the number of customers from 500 to 1000. Our customer service staff don't know enough about our product to answer customers' questions. Our customer service staff can answer 95% of all customer questions. The 6th grade students don't know the history of our country. All 6th grade students can write an essay on our nation's history scoring a passing grade. Once you have defined your goal think about solutions to reach it. Most of the time multiple solutions are needed to achieve your goal. We will illustrate this in the example below. The course goal The course will have a specific goal. The goal of this course is: "Users can design and author an instructionally sound eLearning course". We shortened this goal into a clear course title: 'How to design and author a course'. The next step is to define learning objectives to help the learner reach the goal. Once you've identified the problem, goal and possible solutions, you can begin working on the solution part of the course. 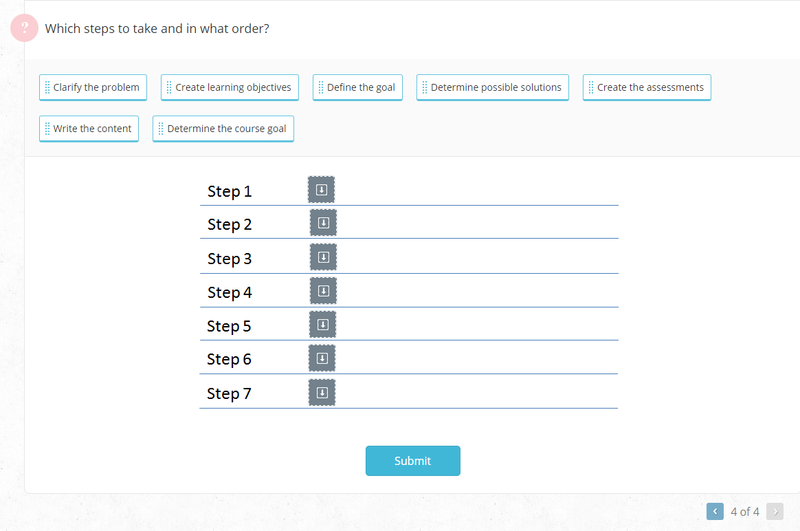 First we need to define the goal of the eLearning course and then add details of how we'll reach the goal. These details are captured in the 'learning objectives'. After defining learning objectives you need to write questions and content that support the learning objectives and the goal of the course. 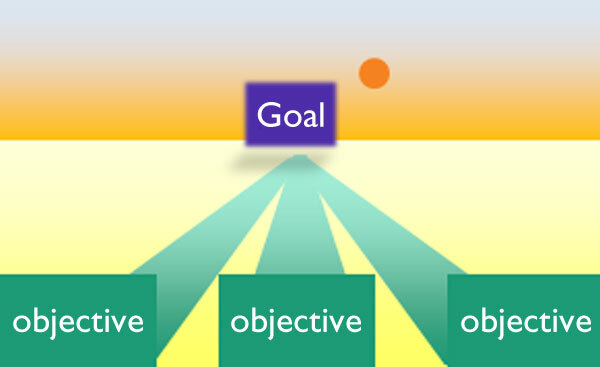 Please restrict yourselves to two levels of objectives: The overall goal (in the title) and the learning objectives. As the course author you need to work out the details of the objectives for yourself, but the learner may not always need that detail. 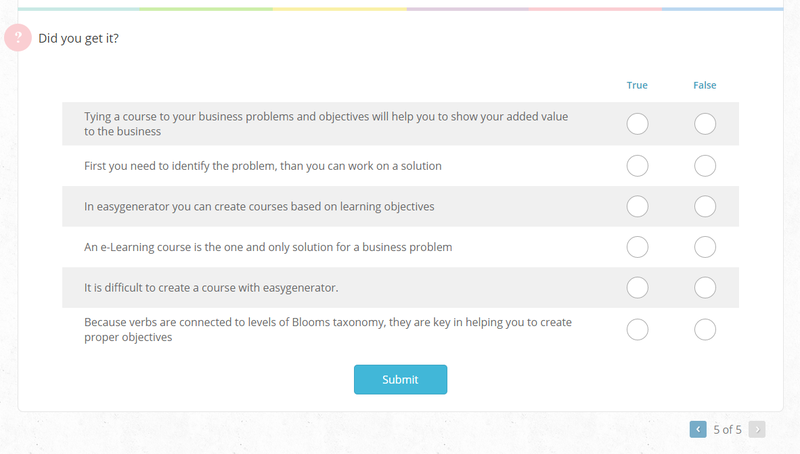 You can use a simplified version of the learning objectives in the course. Before creating any learning solutions you need clarity on the problemgoalsolutionscourse goallearning objective you're trying to solve. Once you've identified the problem you can define your problemsolutionscourse goallearning objectivesgoal . As a third step you need to identify possible solutionsproblemgoalcourse goallearning objectives that can help the learner reach the goal. The course will probably only be a part of the solution. Now you can define the solutionsproblemgoalcourse goallearning objectives and create learning objectivesproblemsolutionscourse goallearning objectives that support the goal in more detail. Which steps to take and in what order? The quality of a course's learning objectives determines the quality of the course. Learning objectives also drive course design and structure and play a major role if a course is co-authored. 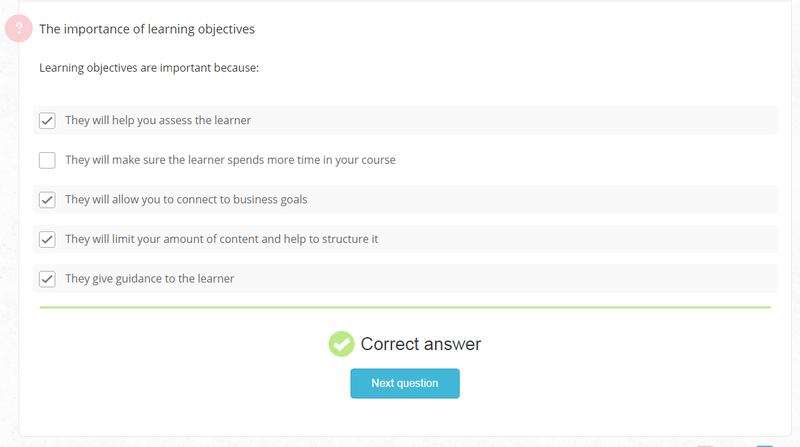 Finally, they support the learner to meet course goals and show how learning goals are tied to business goals. Design Learning objectives support the design process. They provide a structure for the course and help drive and define development of appropriate questions for assessments. Co-authoring Courses are often created by more than one author. Easygenerator facilitates the co-authoring process. Learning objectives ensure all team members are aligned to the course goal. From the learners perspective When learners see objectives at the beginning of a course they know what is expected of them. Learning objectives help the learner decide whether or not to take the course, and in doing so, make a connection between one's own learning goals and the objectives of the course. From the organization's perspective A learning objective is derived from a business need or goal so there is a direct connection. 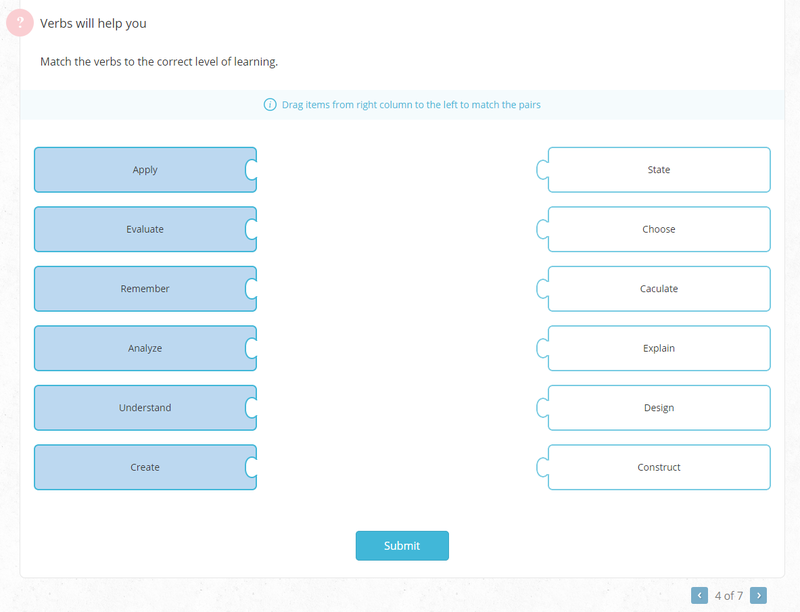 Easygenerator reports learners' results of correctly answered questions per objective. This shows that a direct correlation of learning objectives to business goals can be made. Objectives help connect the learning to the business and provide a measurable outcome to show and report on that contribution. It's time to define learning objectives: they are "brief statements that describe what the learner will be expected to learn (or do) by the end of a course". It is not just acquiring knowledge: the goal of learning is to be able to do something new or do something in a different way than before. Learning is about changing behavior. A good learning objective describes the context in which the behavior needs to take place and it has to describe a measurable level of the performance. 1. Remember: Students can use knowledge and facts from long term memory. 2. Understand: Students can make sense of what has been learned. 3. Apply: Students can use new knowledge or information in a similar situation. 4. Analyse: Students can break down knowledge to see how it all relates. 5. Evaluate: Students are able to judge based on standards. 6. Create. Students can use what was learned and create something new. 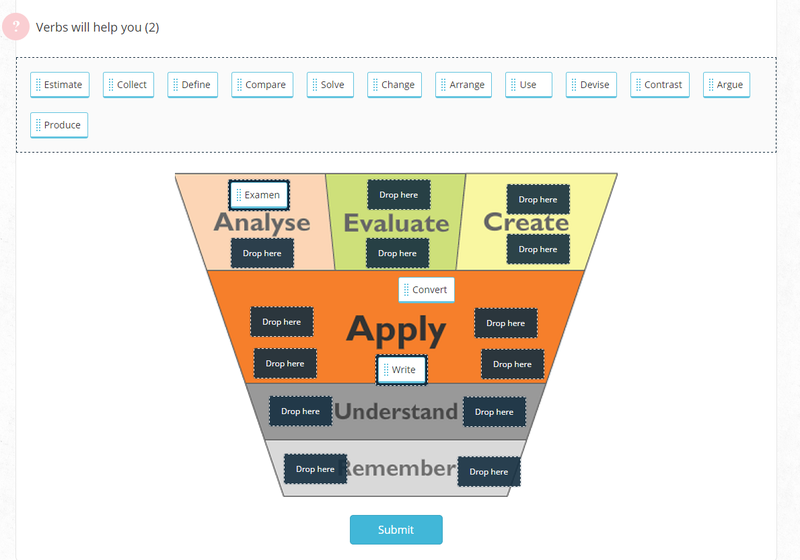 Select the image with the six levels of learning from Bloom's taxonomy. You can enlarge the images by clicking on the button. The button appears when you hover over the image with your mouse. Bloom's learning levels are valuable because they help you state your goals more clearly and write them more succinctly. For each level there is a family of verbs appropriate to describe a behavior for that level. 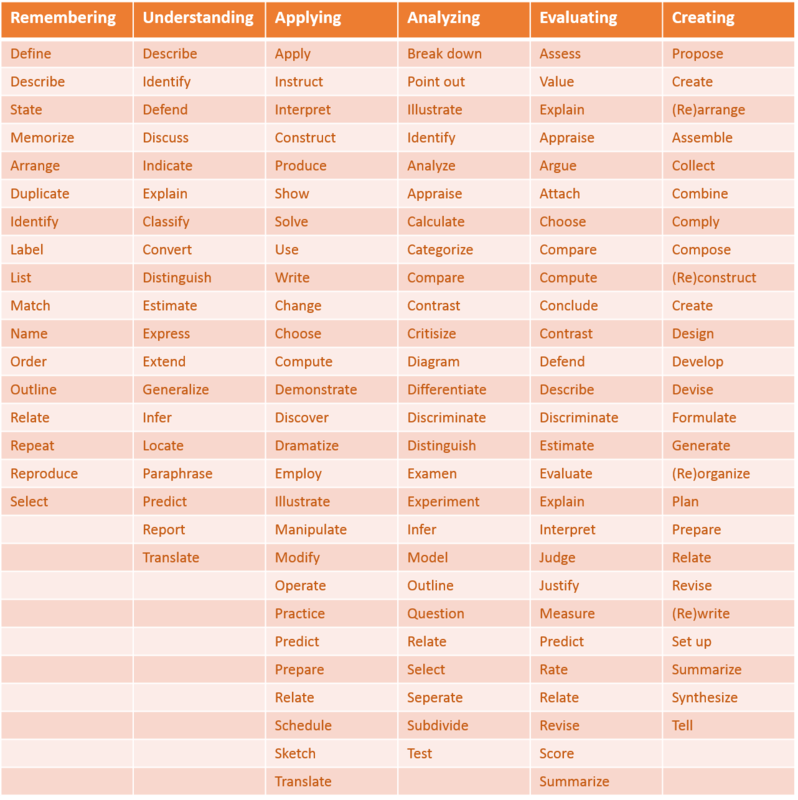 If you have selected a level of learning, you can choose a verb from this table and use it to create a learning objective. Here is a list of the levels and the verbs associated with them. Match the verbs to the correct level of learning. Repetition in eLearning is important. Here is a second question on the levels of learning and their associated verbs. To help you with this question the table is again shown below. Lets review them. The first two objectives use "understand" which is level two of Bloom's taxonomy, but isn't measurable. So we can rewrite them using the verbs Explain and Express which are clearer and measurable. Express the why, the what and the how of learning objectives. apply these principles in an easygenerator eLearning course. 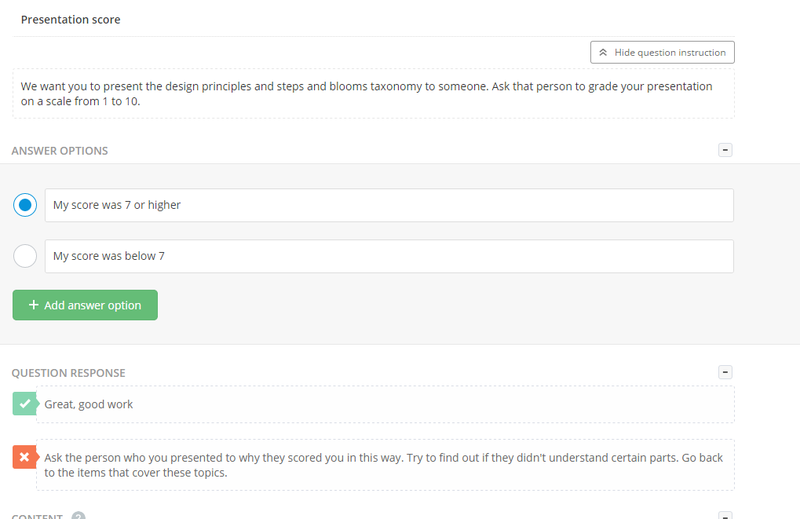 Present the 7 steps for course design and Bloom's 6 levels of learning to someone. Ask that person to grade your presentation on a scale from 1 to 10. The final section of this course is about question (assessment) and content creation. After the course learning objectives have been defined, the next step is to create questions to assess objectives, and create assignments for learner completion. Writing course content doesn't start until after you've created assessments and assignments. Be sure to add only the content necessary for the learner to answer the questions and do the assignments. Less is better; don't create a content heavy course. In this chapter we will go through this course and explain why we have created the questions as they are and the reasons for adding the content pages. There is a short introduction before every question and an image of that question so you don't have to go back and forth. The second question covers all seven steps. It is important to remember the steps and their correct order, which is a crucial part of the approach. We created an ordering question using Drag and Drop question type. It repeats and you have to think about the order of the steps. Before we can use this question we need to explain steps 6 and 7. Because this content is tied to this specific question, we decided to create this content in the content area of the question. 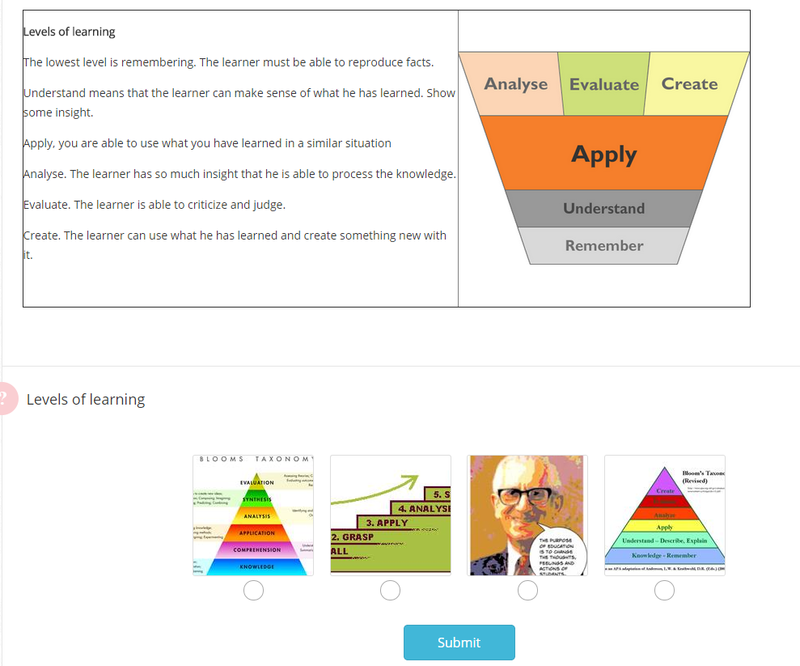 The template automatically arranges this content as an introduction before the learner will see the question. 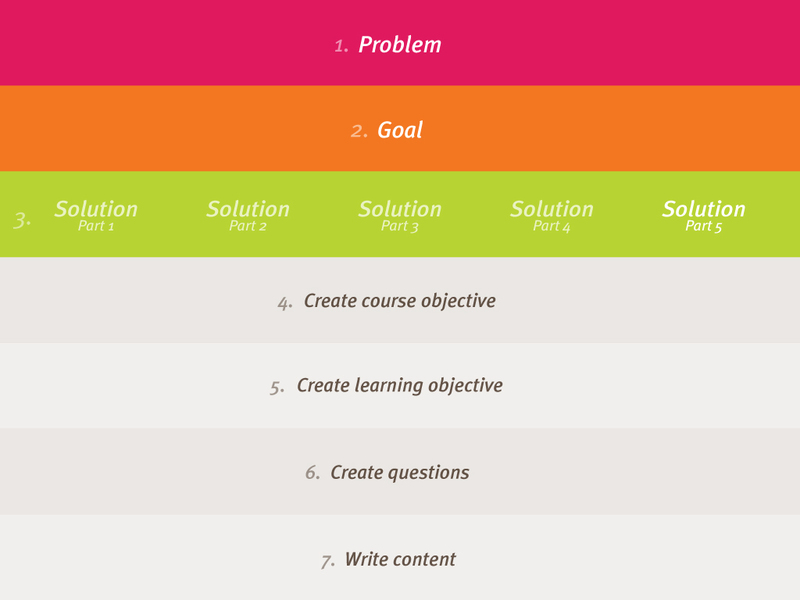 The goal of the first question is to have the learner repeat and check the first 5 steps. We decided to use a fill-in-the blank question that both tests the learner's learning and summarizes at the same time. To do this, we created a short text recap and left out the 5 key words. In order to answer this question, additional content that explains the 5 steps is needed. Again, we decided to split this up and created two pages. The first page includes steps 1,2 and 3, and the second page has steps 4 and 5. These questions are not an exam, they are part of the learning. Therefore we will give the correct answer feedback if you answer the question incorrectly. 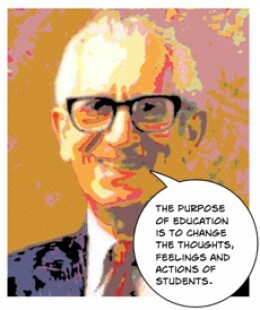 This objective is to ensure that you as the learner know and understand the 7 steps of course creation. 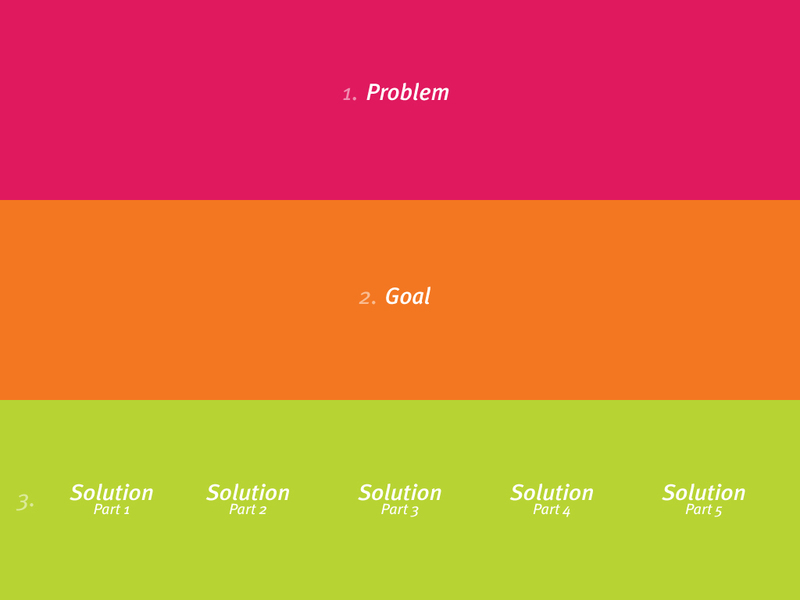 This content was broken down into two components -- the first 5 steps and then the last 2 steps. Therefore, two questions are required -- one about the first 5 steps, and one about the entire process that includes all 7 steps. 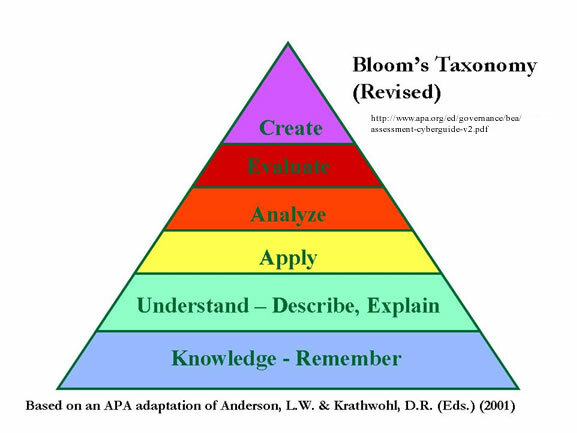 The next step is introducing the verbs connected to the levels of Bloom's taxonomy. It is important you are aware of the connection between the verbs and the levels. We decided a Text Matching question and an introduction (table with levels and verbs) would be the most helpful. The learning goal was 'express the why, what and how'. The best assessment of this goal, is for you to explain it to someone. So as the learner, you have the assignment to give a short presentation to someone about design principles and Bloom's taxonomy. We will precede this page with an explanation on how we adapted our objectives using this knowledge. Because the verbs are so helpful in creating correct objectives, we want to show it to you again to be sure you pay attention to it. To achieve this, we used a Drag and Drop question, where you have to drag multiple verbs to the correct level. Since you can't know the entire table of verbs by heart, we will add the table, forcing you to review it multiple times. 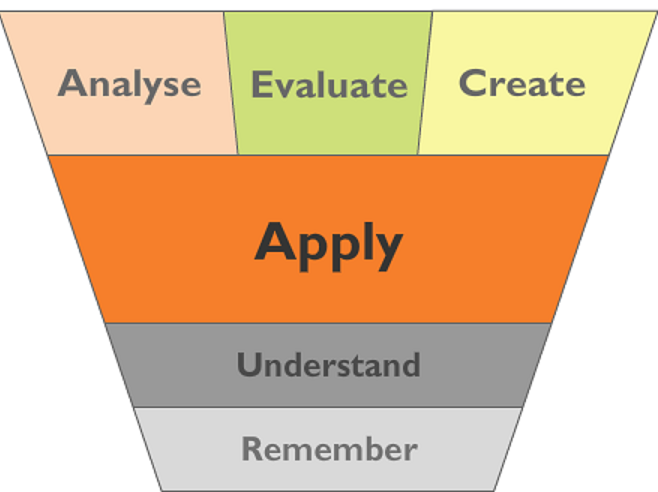 Bloom's taxonomy is an important tool and reference to use when creating learning objectives. The six levels of learning are especially important to explain to the learner how they will be able to use the information. 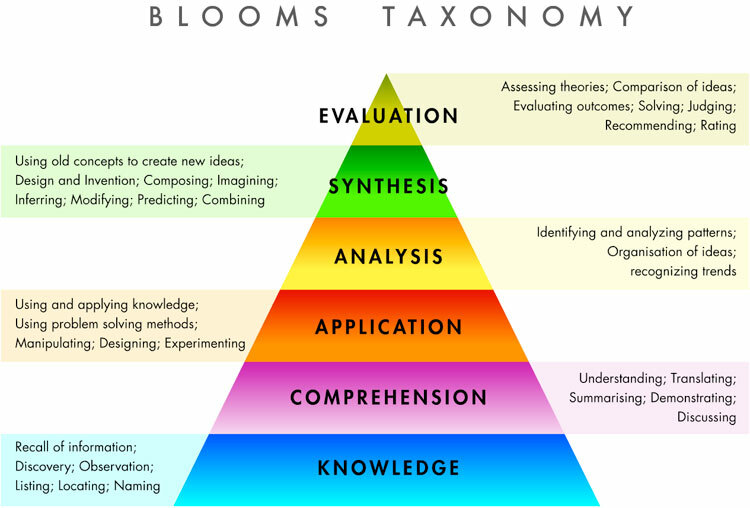 There are two versions of Bloom's taxonomy which may cause some confusion. We will use the updated version. This assessment uses a Single Choice Image question with an explanation added to the question. The second objective is about learning objectives. The first step is to understand why learning objectives are important. We will start with a multiple choice question with correct and incorrect answer options. The explanation text is added directly to the question. Step two is the What. We will assess this using a single choice question, asking the learner to identify the correct definition. Of course we will add the explanation to it. And we want you to show us that you can apply all this. Therefore we want you to share your course with easygenerator. We will review it and comment on it. The last page of this course outlines this assignment. The final objective of the course is that you, as the learner, are able to apply the principles of course design to creating a course in easygenerator. Before we ask you to complete this assignment, we will repeat some the the information in this course. Repetition is key to learning. This course has only one statement question that you need to identify the correct answers. You will find that statement question on the next page. It is difficult to create a course with easygenerator. Since the goal of this objective is that you apply this new knowledge in easygenerator, we ask you to do just that. Create a course in easygenerator and apply these principles. 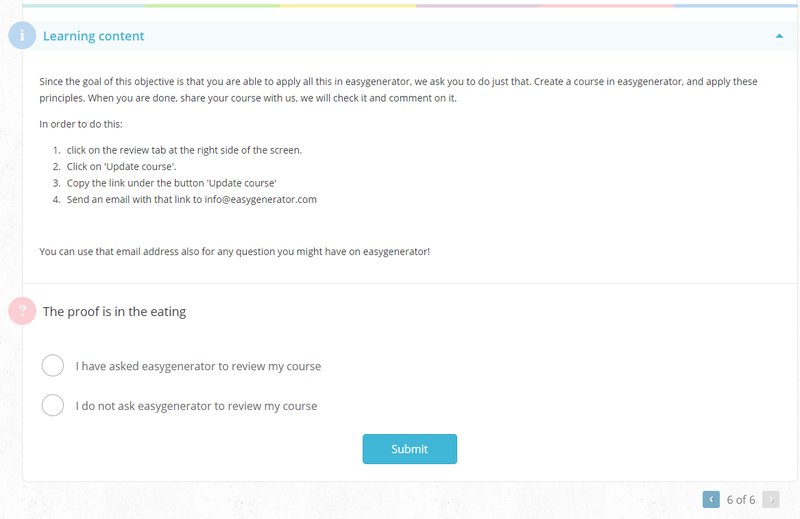 When you finish the course, send it to us at easygenerator and we will review it and give you feedback on it. Click on the review tab at the right side of the screen. You can also use that email address for any question you might have on easygenerator!